Hello BITC readers it’s Sarah G! Thank you for reading my little food blogs. I appreciate sharing my journey and joining the online conversation about food and treating ourselves with respect and love. This month, I really didn’t know what to contribute. I was trying to think of what was currently on my mind, foodwise. I’ve been working a full work week with a three hour daily commute. I love what I’m doing and what I’m learning about, but it doesn’t leave a lot of time to cook in the evenings before I crash for the night. Food prepping on the weekends has become a way for me to eat home cooked food during the week. 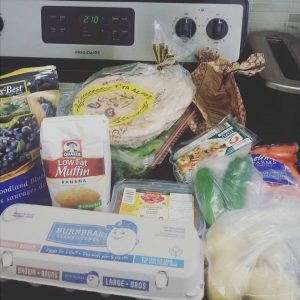 There aren’t many healthy options close to my work place, which has been a blessing because it has forced me to improve my food prepping and helped me to plan ahead. I had to learn to enjoy food prepping. It can be a boring task, especially when it’s a beautiful sunny Sunday, and there’s so much to do. For me, it was learning to enjoy spending the time feeling (somewhat) organized and knowing that I’ve set myself up well for the coming week. I like to drink way too much coffee, put on some Netflix (current marathon: Ugly Delicious), and relax between time spent cooking. Today, I decided on egg cups, muffins, and roast veggies to use for my breakfasts/lunches/snacks this week. Nothing fancy, food that you don’t have to think about too much. 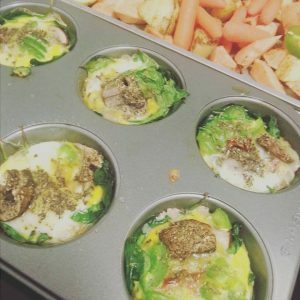 For the egg cups I used my muffin pan with some coconut oil, five eggs, spinach, sundried tomatoes, mushrooms, jalapenos, and topped with a pinch of oregano and salt to taste. No measuring involved, I used enough ingredients to fill up a tray with six portions. Cook the egg cups at 350 degrees F for about 15 minutes, or until the tops are firm. 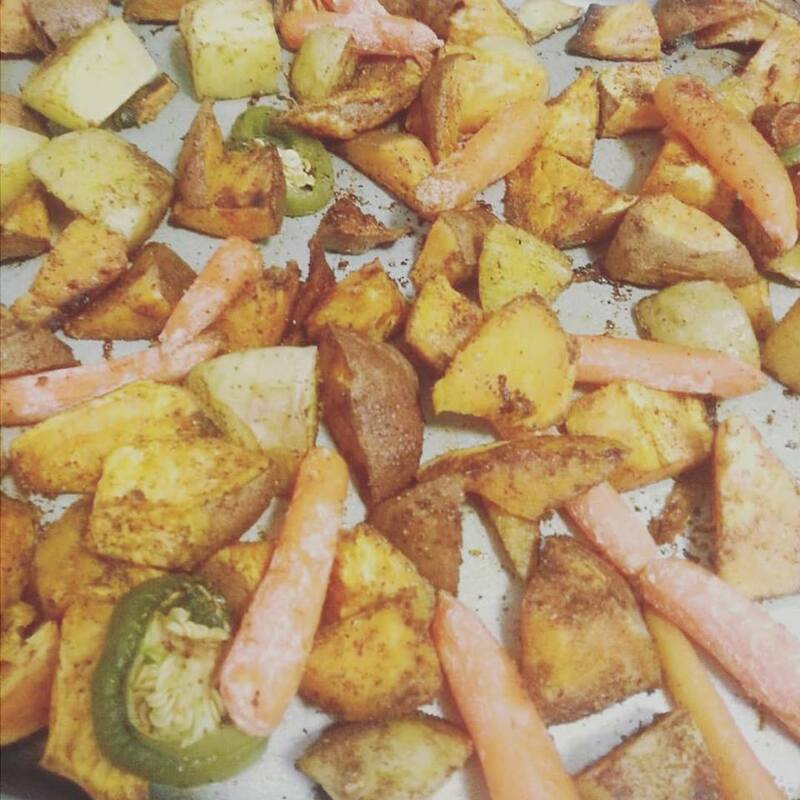 Next, I cut up a sweet potato and a couple of yellow potatoes for my roast veggies. After greasing the baking sheet with some coconut cooking oil: add the potatoes, some baby carrots (I take this shortcut because, why not? ), and mix them up with a few shakes of garam masala, chili powder, and a small douse of olive oil. Then added a few slices of leftover jalapeno. 40 minutes in the oven at 400 degrees F, and I have some yummy veggies that I can add to my lunches and dinners during the week. 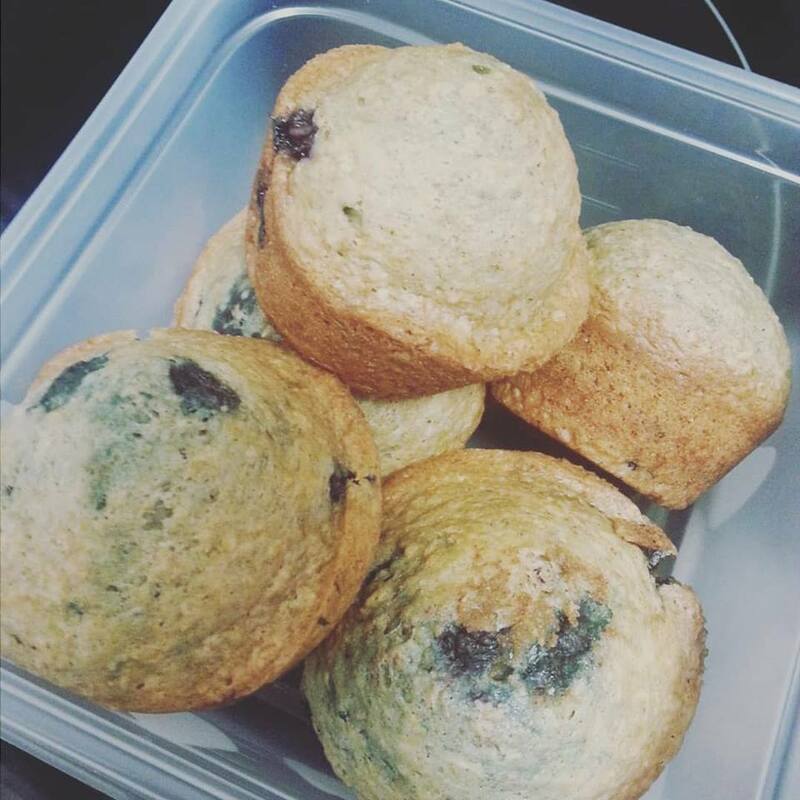 Finally, I moved onto my muffins. I am no expert baker, and I take shortcuts to make my life easier. This time around I went with a banana muffin mix. Followed the recipe but added some cinnamon and frozen blueberries. Making a batch or two of muffins during the weekend is a great way to have affordable and ready-to-go breakfasts and snacks when you just have no extra time in the mornings. I’m a night owl and I have to get up at 6 am weekdays; I’ve learned that I need to make things in advance in order to be kind to myself, and have these already-made options available. That feels really strange to say, because until recently I would routinely forget or put off eating my first meal of the day until 5 pm, or until I just had to grab something a lot more unhealthier on-the-go. 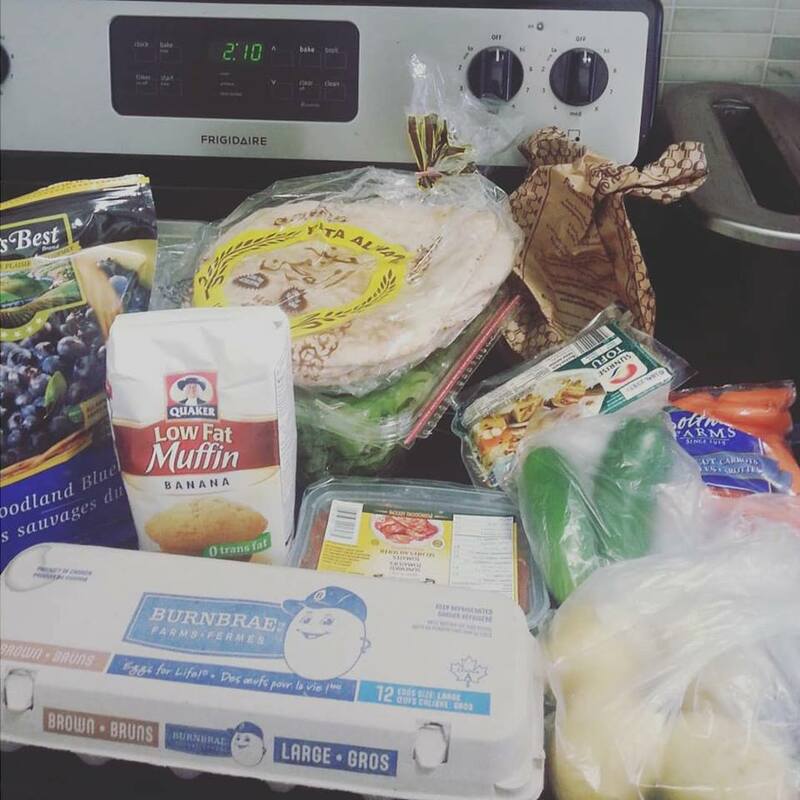 I feel like food prepping has become a lot more popular and trendy, but for me, it really has helped having those already-made foods that I can just grab, and use as additions to my meals throughout the week. I still cook in the evenings, but this has been a way for me to eat in a more balanced way where I’m eating small meals, more often during the week days. The more I spend time taking that Sunday afternoon, or few hours in the evening to leisurely cook and focus on this feel-good task, the more I know I am spending time on helping myself make healthier choices and living a happier life. Cheers to taking that time for self-care, and to Spring on its way!